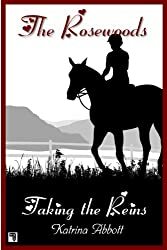 Taking the Reins is book one in the Rosewoods series by Katrina Abbott following Brooklyn Prescott to her new boarding school, Rosewood. Brooklyn is now at an all girls school after a couple years in England. Her new roommate is pretty great. Not to mention the boy she met on move in day, swoon worthy Will. Then there’s the one in the stables, Brady, who turns out to be her riding instructor complete with private training. Or Jared, the child actor almost unrecognizable for his new good looks and sweet demeanor. So, the all girls school doesn’t seem to be so bad. I found Brooklyn an interesting character. A little flighty and sometimes slightly dishonest, mostly by exaggeration. But she develops a sweet friendship with her roommate and now has a boy problem, which is a little funny considering. If you like the sound of this one, try Taking The Reins on Amazon.